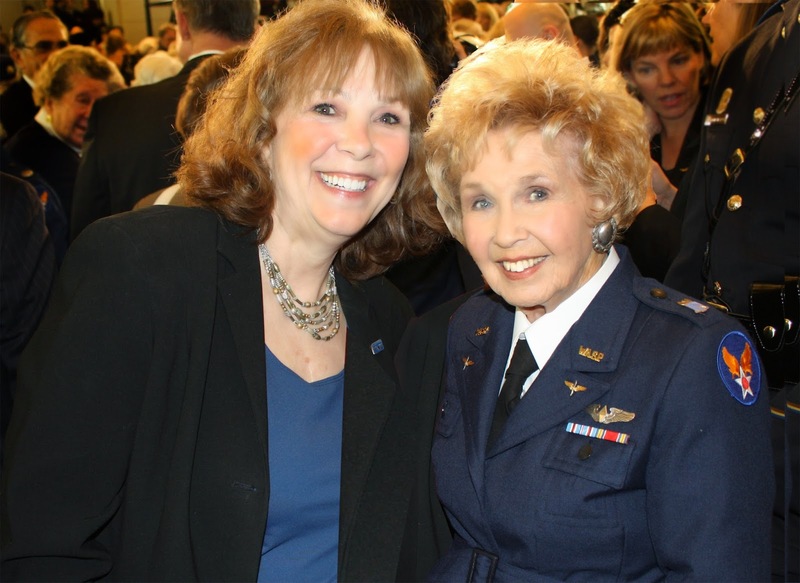 Waco, Texas — February 17, 2015 —Women in Aviation International has announced the induction of mother daughter team, Deanie and Nancy Parrish of Wings Across America; Priscilla (Pat) Blum, founder of the Corporate Angel Network; and Phoebe Omlie, extraordinary aviation trailblazer, into the Women in Aviation International’s prestigious Pioneer Hall of Fame. These “women who changed aviation history,” will be honored at WAI’s 26th Annual International Conference, held on March 5 - 7, 2015 at the Hilton Anatole in Dallas, Texas. The ceremony will take place at the closing banquet on Saturday, March 7, 2015. Deanie and Nancy Parrish’s selection honors their ongoing mission to educate and inspire America with the little known history of the Women Airforce Service Pilots, WASP, the first women in history to fly America’s military aircraft. The Parrish’s achievements include creating Wings Across America, a non-profit project at Baylor University; interviewing and digitally videotaping the oral histories of 105 WASP across the US; creating the comprehensive “WASP on the Web” website; founding the National WASP WWII Museum; initiating and leading the 2009 campaign to award the WASP the Congressional Gold Medal (the nation’s highest civilian award); initiating and leading the campaign to induct the Texas WASP into the Texas Aviation Hall of Fame; writing/publishing WASP In Their Own Words, An Illustrated History; designing two traveling WASP exhibits (including the first interactive exhibit: Flygirls of WWII, most recently displayed at the Story of Texas Museum in Austin, Texas); designing the first WASP app: Flygirl WWII; and writing the first WASP rap song: We Got The Stuff, The Right Stuff. Priscilla (Pat) Blum, along with Jay Weinberg, founded Corporate Angel Network (CAN), a 34 year old not for profit organization whose mission is to arrange free travel for cancer patients traveling to and from their treatment centers in the available seats on board corporate jet aircraft. In its first full year, 1982, a dozen corporations flew a total of 23 cancer patient flights. In 2014, 560 corporations signed on as CAN providers and an average of 220 cancer patients were flown each month for an annual total of 2550. The 47,000th cancer patient will be flown in Feb 2015. Phoebe Omlie: Once one of the most famous women in America, Phoebe Omlie earned the first Commercial Pilot's License by a woman and became a successful air racer. During the New Deal, she held executive positions in federal aeronautics. During the 1920s, she bought a JN-4D and learned how to perform stunts with her future husband Vernon. She danced the Charleston on the top wing, hung by her teeth below the airplane, and performed parachute stunts in the Phoebe Fairgrave Flying Circus. The 2015 Conference celebrates 26 years of WAI Conferences. With the theme "Connect, Engage, Inspire," the WAI Conference will include professional development seminars, education sessions, tours, workshops, networking events, speakers, and a commercial exhibit area. The Conference concludes on Saturday evening, March 7, 2015, with WAI's annual banquet where dozens of scholarships are awarded and the four Pioneers are inducted. Secure online registration is available at www.wai.org/15conference, and varied registration options exist. Student rates and military rates make the Conference more affordable. In addition, WAI offers an "Accompanied Child" rate. Conference attendees may register for a full package, a one-day package or simply for specific events. Onsite registration will be available as well. Women in Aviation, International is a nonprofit 501(C)(3) organization dedicated to providing networking, mentoring and scholarship opportunities for women and men who are striving for challenging and fulfilling careers in the aviation and aerospace industries. For more information, contact WAI at 3647 State Route 503 South, West Alexandria, OH 45381, Phone (937) 839-4647; Fax (937) 839-4645 or through www.wai.org.